Pearson IT Certification is a leader in providing the highest quality learning solutions for CompTIA certification candidates. Here you will find all the exam training material you need to prepare for success on your CompTIA Security+ exam. Our self-study resources provide complete and comprehensive learning in multiple formats, including complete video courses, practice tests, books, and eBooks. Become CompTIA Security+ certified and advance your career in IT Security. 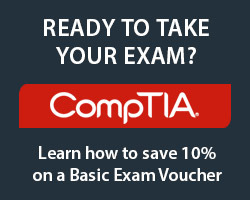 * Coupon SEC501 confers a 50% discount off the list price of eligible full-course CompTIA Security+ SY0-501 video titles, and a 30% discount off the list price of eligible CompTIA Security+ SY0-501 print and eBook titles, purchased on pearsonITcertification.com. Eligible titles include featured SY0-501 titles only. Coupon does not apply to book + eBook "Best Value" or "Additional Savings" bundles, individual video lessons, Safari Books Online, or any title featured as eBook Deal of the Week or Video Deal of the Week. Coupon offer expires December 31, 2019. May not be combined with any other offer. Not redeemable for cash. Offer subject to change.